We recently noticed white ‘clouds’ in our pine trees – like blobs of candy floss abandoned high up in the branches. 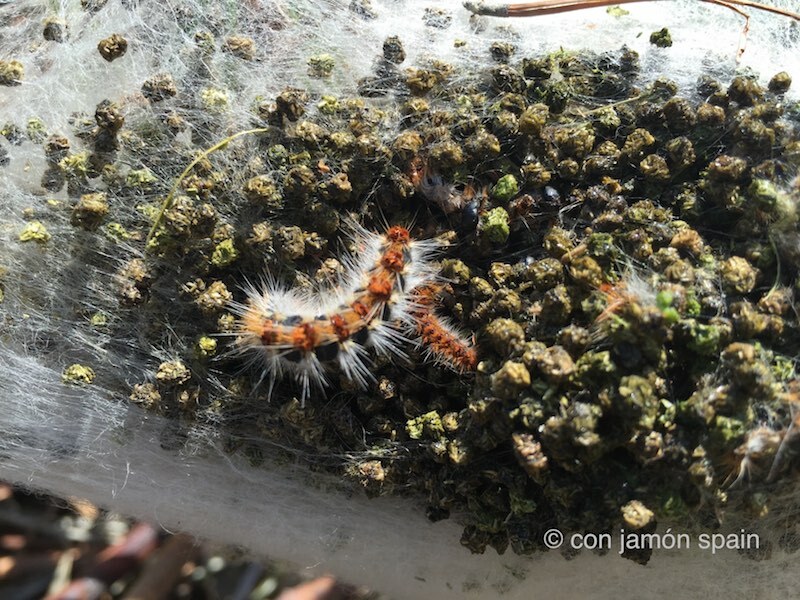 We discovered they were the silk nests of processionary caterpillars. Should you touch one – or a dog or cat step on one – it can be very unpleasant and even fatal to animals, especially if they begin to lick their paws after coming into contact with them. With our clan of cats and the neighbours’ dogs who occasionally come to say hello, we took no chances and got rid of them today. Thaumetopoea pityocampa is a moth whose caterpillar larvae defend themselves with a furry armour of irritating, harpoon-like hairs. These contain a highly-allergenic protein which in humans can cause reactions ranging from itching to anaphylactic shock. Its life cycle begins in August when the moth lays up to 300 eggs on pine needles. In winter, even in cold temperatures, they leave their nest at night to feed. During the day in the sunshine, the nests are warmed helping them metabolise the food they collect during their nightly excursions. Come March, the caterpillars leave their nest marching in a line (hence processionary) in search of a place where they can bury themselves underground. There they spin cocoons and metamorphose into moths in August, and the cycle begins again. The French entomologist and author, Jean-Henri Fabre, who died 100 years ago, studied the species and carried out an experiment in 1896. Using a plant pot, he placed an unbroken ring of caterpillars on its edge near to food. The caterpillars circled the pot edge for seven days (and around 335 times), not once deviating from their progression. Eventually exhausted and, of course, hungry, they gradually dispersed. Here’s a short film somebody else made of them doing the conga. You can read Fabre’s wordy, but poetic, explanation of processionary caterpillars here. We saw the longest line we’d ever witnessed this last weekend near Pedraforca. An estimated 180 caterpillars in a line about 4 meters long. My question is: How much damage do they do to pine forests and are their numbers increasing due to climate change or other factors? Wow, that’s amazing. There are some fascinating videos out there. Who knows about the climate change thing, perhaps. I’d like to see some numbers on prevalence of these things over time. They ravage the pines, but I don’t know if they’re becoming more common or not. Something to look into. Amazing. That experiment seems a bit mean–like being stuck forever on an Escher staircase. Know what you mean – perhaps they got some food in return for their week-long toil. It’s still January, but I saw a lot of them this weekend hiking near Bilbao…hmmmmm. Seems early as it’s normally Spring – maybe the odd weather…? Not sure about the northern Spain but here in Andalucia, there’s been little rain and it’s been mild.